STS-101--and she received the NASA Exceptional Service Medal. She remains involved with NASA and space exploration, and she is the only astronaut serving on the NASA Advisory Council Committee on Technology, Innovation and Engineering, which advises NASA leadership on its investments in future space technologies. Weber is an acclaimed speaker with decades of experience, including being a keynote speaker for diverse clients in wide-ranging venues, hosting a NASA TV show, co-hosting a town hall with a U.S. Vice President, and testifying before the U.S. Senate. She was hosted by the U.S. State Department on tours throughout India, Canada, Egypt and Morocco. In addition, for over 15 years, she has been a “go-to” space analyst for news outlets including BBC Radio, Fox Business, and local TV. Furthermore, her prowess in speaking led to her becoming a speaking coach for a numerous C-suite executives. Weber has been Executive Education faculty at the Kellogg School of Management, Northwestern University, since 2012, and a recurring lecturer at McCombs School of Business, University of Texas at Austin, in the “Tower Fellows” program for senior executives and for MBA/law students since 2009. Informing her insights into high-risk high-stakes decision making, Weber is currently an active nationally competitive skydiver and has been for over 30 years. She has nearly 6,000 skydives, two dozen medals to date ​at the U.S. National Skydiving Championships, and a world record, and she has skydived in commercials. 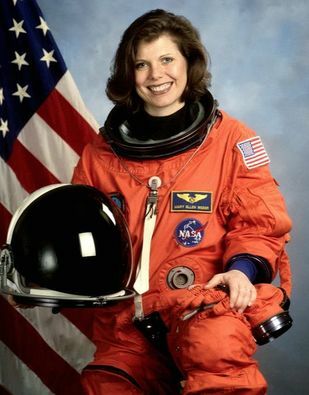 She became an instrument-rate pilot prior to NASA and flew 600 hours in T-38 jets at NASA. Weber served as vice president for nine years at UT Southwestern Medical Center, a world-renowned medical school, research powerhouse, and hospital complex, and she has served on numerous non-profit boards.